To mark the 10th anniversary issue of StyleSpeak magazine C&E Media had made a recent foray into the multimedia specialization with a unique hairdressing and hairstyling DVD aimed at those salon professionals who want to add a creative yet functional flair to work. The StyleSpeak Cut and Style DVD Vol.1 has been a runaway success with the hair professionals all over the country and the positive feedback has been overwhelming. 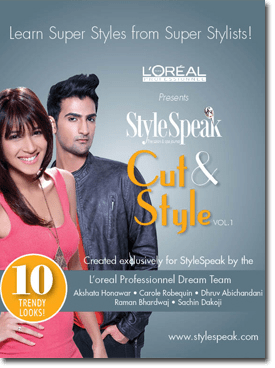 The Cut and Style DVD shows how to do 10 trendy and yet highly adaptable looks that have been exclusively crafted for StyleSpeak by the L’Oreal Professionel Dream Team. Top hairdressers Akshata Honawar, Carole Robequin, Dhruv Abhchandani, Raman Bhardwaj and Sachin Dakoji came together to show how to use creative thinking to give an unexpected and lively twist to a boring hairstyle. Each of the acclaimed artists have shown two looks, all of which are suitable for multiple face structures and can be easily revamped or simplified as per convenience. C&E Media was formed in 2002 as a part of Conferences & Exhibitions. C&E Media has three titles under its umbrella – StyleSpeak, Spa Mantra and GlamStar.